Find A Barrier Free Shower System That’s Just Right For You. One of the primary considerations to make, is what size barrier free shower unit do you want? It mainly depends on personal preference and size of the bath area. A good choice is this 48” x34”x81 1/8”. 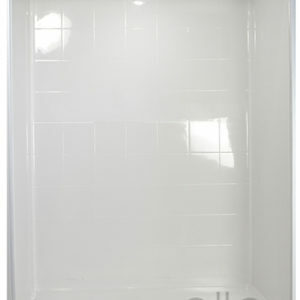 It has a four piece RealTile barrier with ½” beveled threshold. The low step in shower model makes entering the shower more manageable for those that may have a fear of falling in the bath. 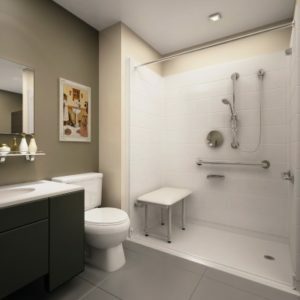 Walk in handicapped showers can provide a place to sit while you take a shower. The bather can use the handheld shower wand without the need for standing while taking a shower. Talk with an Aging Safely Senior Bath Representative today and they can help you go over numerous options. 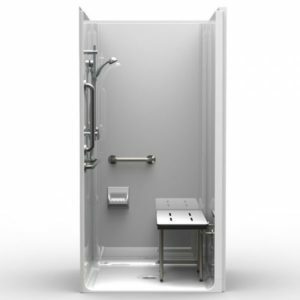 We want to answer all of your questions about wheelchair accessible showers and make sure you enjoy your shower unit for years to come. Almost all of Aging Safely’s handicap accessible shower and bath systems can be equipped with a thermal mixing valve (TMV). These devices simply regulate the flow of hot to cold water. You can set the device to a desired temperature, thus eliminating the need for you to set the water temperature every time. This may also be a great feature for bathers that have cognitive conditions that affect their reasoning, or have problems with fine motor skills. Being scalded by hot water in the bath can be a concern for many. A TMV can be another precaution to take and add extra peace of mind when it’s needed. A specialty disability shower like this doesn’t have to look institutional. Our made in America roll in showers can have custom colorization and design patterns inlaid into the surround walls. You can get creative and add designer grab bars to make it exactly how you want it. The shower seat transfer benches make getting in and out much easier for some bathers. When utilizing a transfer board, one can transfer onto the seat, or with the assistance of a caretaker. Safety is our number one concern. It is our greatest desire, that our products can help you and your loves ones enjoy bathing to its fullest.